Spring is here in Mount Airy, North Carolina and it is time to celebrate with some good ole’ blue grass music festivals and food truck events. These talk-of-the-town events are well known and enjoyed in Mount Airy, North Carolina. Mount Airy Toyota is geared up for the season of loud music and good food with car specials left and right! From saving on classic and well loved vehicles like the Toyota Camry and Toyota Corolla to the Toyota 4Runner, Mount Airy has a vehicle for you! 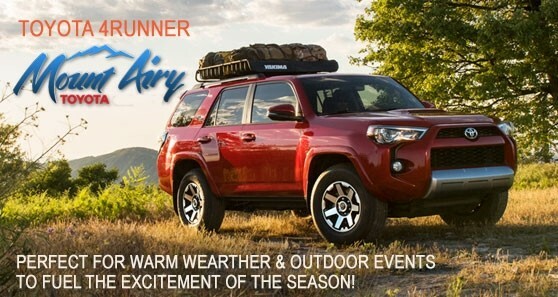 This Spring It is all about the Toyota 4Runner! With large storage space, a roomie interior, and off-roading abilities, this vehicle is sure to bring the party wherever you go! Mount Airy Loves Bluegrass Spring is here! And you know what that means, it’s officially bluegrass music time! If there’s one activity you know will get everyone in Mount Airy excited and outdoors, its bluegrass music and the accompanying festivals. Mount Airy host conventions and music events all season long to help get neighbors excited. Bluegrass fans travel from all around North Carolina and surrounding regions to party it up, Mount Airy style! The Pie Factory hosts regular celebrations with jam sessions and the Mount Airy convention center is hosting a two-day music festival. Free Bluegrass and Old-Time Music Jam Session If you are looking for an exciting outing with friends, family, and food the FREE Bluegrass and Old-Time Music Jam Session is a weekly event you don’t want to miss! This live jam session is a routine event that is celebrated every Tuesday from 6pm to 8pm at The Pie Factory, supplemented with great food. Mount Airy Bluegrass and Old-Time Fiddlers’ Convention The famous Mount Airy Blue Grass and Old-Time Fiddlers’ Convention is where folks can hear traditional music of the North Carolina Mountains. 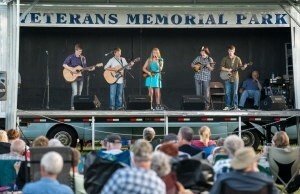 This family-friendly event is held in the Veterans Memorial Park in Mount Airy, North Carolina. Pray for sunny skies, as this music festival will be held rain or shine. Since you’ll be driving your 4Runner, go ahead and throw some lawn chairs in the back for seating. We are certain this event will be the talk of the town with good vibes and music that’ll roll through the Blue Ridge Mountains. This event is free for children under six, 10 dollars a day for adults, and 20 dollars for contestants. For more information on the Mount Airy Bluegrass and Old-Time Fiddlers’ Convention call (336) 345-7388. 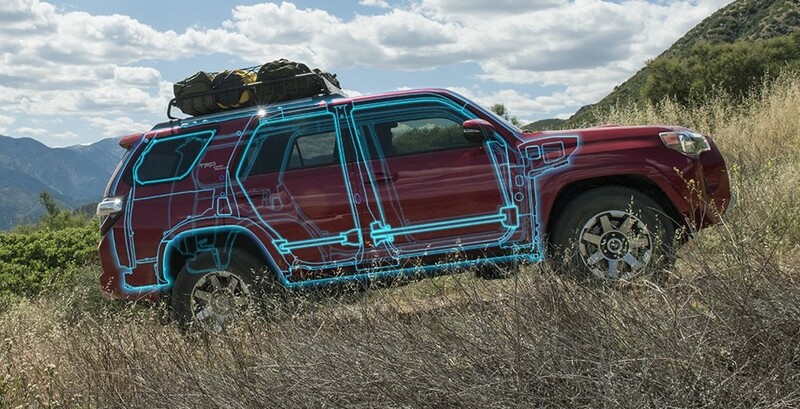 Why the 4Runner? The 2017 Toyota 4Runner is the all-things-outdoor vehicle that is fully equipped for spring and summer excitement. From tailgating to camping trip, food trucks and blue grass music festivals, this is versatile vehicle is ready for an adventure! The chrome accent and designer projector- beam headlights define the appearance of the vehicle and make it demand attention! These hard-to-miss features are bold and grasp the attention of all those who see the vehicle. This vehicle comes equipped with 17- inch alloy wheels and projector-beam headlights. The strong headlights work well for both the style and the usability of the vehicle. The smoked trim adds boldness to the exterior design while the headlights have a higher focused beam and have Daytime Running Lights for better visibility. The most important interior feature for long trips to the mountains and afternoons of tailgating is keeping your passengers comfortable and happy, and that means having a little extra room in the vehicle. 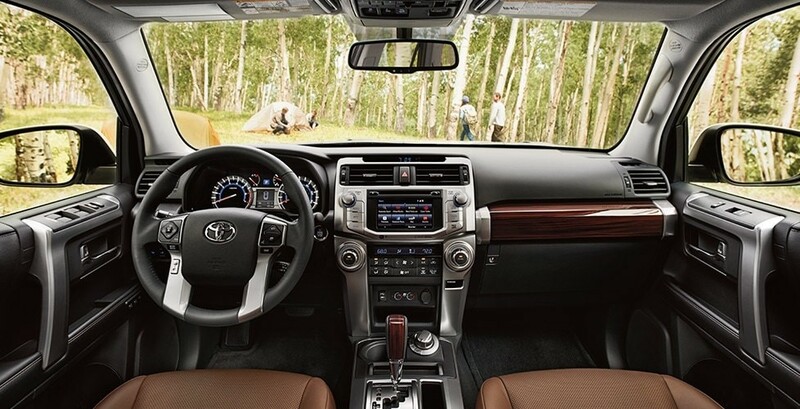 The 4Runner has seats that are a soft leather, with the option of heated and ventilated seats, reclining back row seats, and an active headrest. These ensure maximum comfort for long rides. 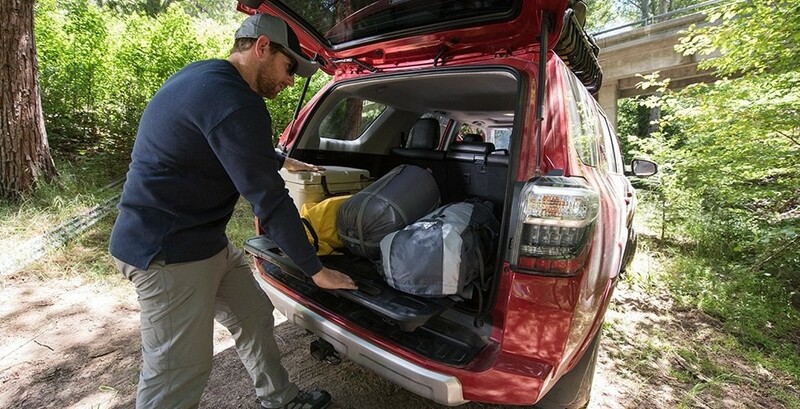 The 4Runner is also designed with meeting your storage needs. The second-row seats fold-flat, making room to accommodate all of your sleeping bags, coolers, tents, and more. Then, if the seats in the back are folded down, you can allow for 88 cubic feet of cargo! The cargo trunk space has a sliding rear cargo deck that makes for quick access to your belongings. The sliding rear cargo deck can support up to 440lbs. This is great for a speedy setup before heading on a trip. These core technology features are designed for safety, entertainment, and enjoyable rides. With the Entune App Suite, you have access to mobile apps and data on the 6.1-in high-resolution touch-screen display in the 4Runner. 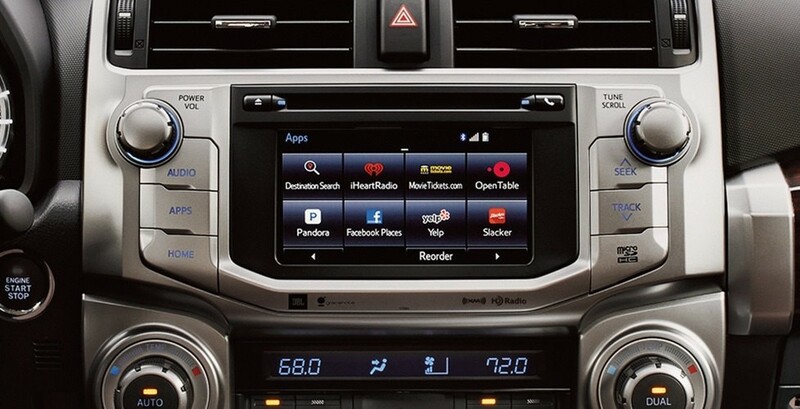 Use Pandora to listen to your favorite bands or use Open Table to make dinner reservations. The 120v AC power outlet in the rear of the vehicle is perfect for tailgating, keeping your phone charged, or connecting a speaker to liven up the party. 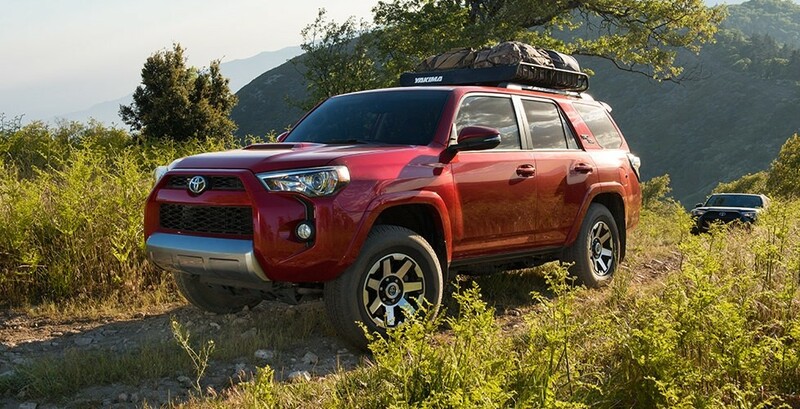 Overall the 4Runner is the perfect vehicle for family fun, off-roading outings, and all things outdoors in the beautiful Mount Airy, North Carolina. We’ll be seeing the 4Runner on the Blue Ridge Parkway and the Blue Grass Music Festivals. 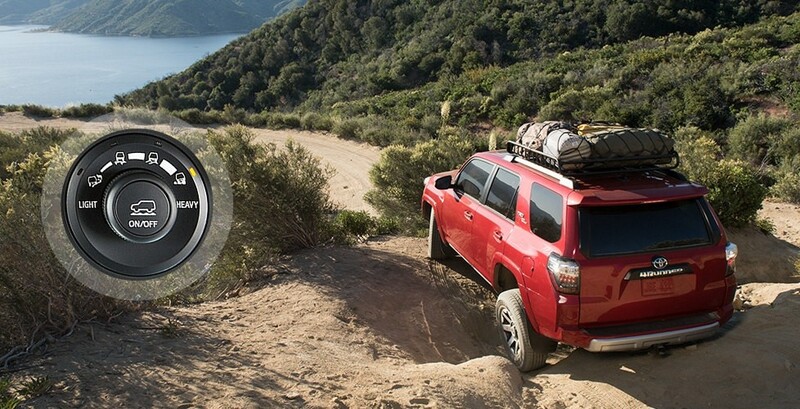 As great off the road as it is on, the Toyota 4Runner is your vehicle for all things outdoors! 508 N Andy Griffith Pkwy. Mount Airy Toyota	36.5096993, -80.6243259.